In the current fascination with supernatural fiction with fashionable vampires and their confused morals, it is refreshing to see a novel focusing on the evil that lies in such worlds. There are fantasy elements in this book and I found it far better than some of the older demon-novels in “Christian fiction.” I would suggest starting with the first book (this is the second in the series) if you haven’t already. As with that one, there are some direct references to Hugh Ross and his Beyond the Cosmos. I think Bruce’s books could have appeal outside of the Christian market, though I doubt the publisher is marketing as such. I had the good fortune to review Bruce Hennigan’s first book in this series, The 13th Demon, when it was published. I liked what I read, and was very happy to see the second book pop up as available to review in an email. This book is even better than the first book. There is a vampire craze going on nowadays in movies, books, and TV shows. They all glorify vampires and make them out to be something they aren’t. It is unusual to read a book where they are portrayed as evil and demonic, and not having any good qualities. I have to think that if they really did exist, that they would most likely be closer to what this book portrays them as, rather than the Twilight type. Bruce Hennigan has done it again. The Twelfth Demon is everything a good suspense novel should be and will have you realizing you’ve been holding your breath for way too long. Interesting characters, a plot that speeds along, and a message you can ponder for a very long time convince me of two things…The Twelfth Demon is a hit, and Bruce Hennigan is the real deal. into that novel. It must be really good. I want to read it!” You’re a fantastic writer, Bruce. This book is not for the faint of heart! A rare thing it is for me to pick up a book that I do not put down till it is read from cover to cover, but this is one of them. I read The 13th Demon Alter of the Spiral Eye in three hours. I would have gone to bed, since I started it so late at night, but this book has enough of the Spirit Realm in it that I knew better than to sleep with out having read the ending. The introduction soon leaves off into the main stories and it just never lets up. The action in the physical and spiritual realms never lets up, nor the plot, nor the draw that is felt to the main characters. I can tell you that Bruce Hennigan has a great grip on demons, and humans. I thought it was very witty to tie the Aztex and Incas into the story, and then how it all ties up in that one artifact that was quite evil. I frankly remember my reaction to such “art” when I studied it in college, along with my being as equally repelled by human sacrifice as were the Christians in this book. I hope to not offend Mr. Hennigan should he ever read my review, but I found the movie like write up reminiscent of Silent Hill. That is movie I wound up watching by “accident” and one that has no Christian content other than Hell and being lost eternally in a lot of horrors, but the wild and sometimes unpredictable demonic manifestations are just as dramatic. In that aspect I am sure this would scare the dear “blue haired Grandmothers” of certain denominations to bits! However, for those of us who have seen “too much”, we know we fight demons just as livid, just as real as they are in The 13th Demon on a regular basis. Some people just never see them with their physical eyes, and others of us do. 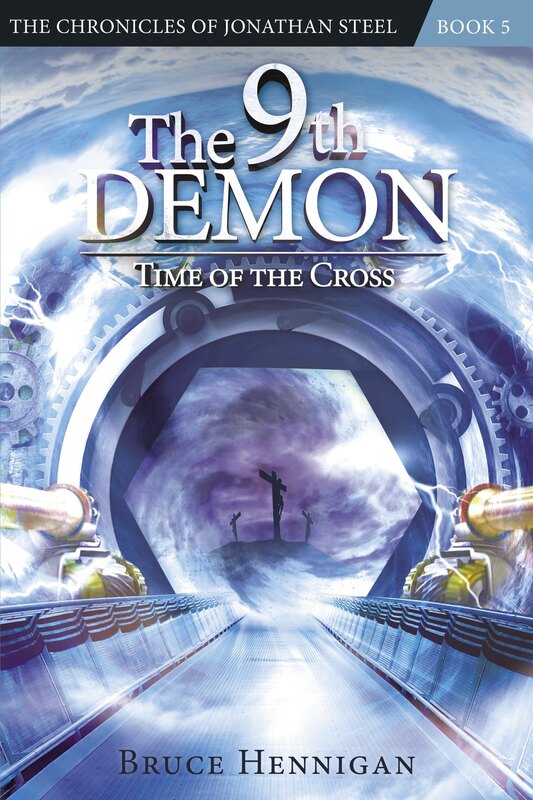 The 13th Demon was very well written and gets you hooked the moment you begin reading this book. The author, Bruce Hennigan is a very imaginative. The journey will begin within the first page, but where does one look to find the demons and to prevent evil? Steel will help several people during his journey with demons and the Spiral Eye. What caused Steel’s amnesia? Throughout the story he slowly gains his memory back, but will he completely gain his memory back? This story shows us the demons that we fight within and Steel will help others find Christ through a very different way. Will Jonathan keep his promises? You have to read to find out. It might seem odd to say that a Christian book is creepy, but this one was creepy – but I thoroughly enjoyed it. Some of it seems a stretch of what demons would and could actually do, but then I am no expert on that matter, so the events in the book could very well happen. The book does show through a fictonal story how real evil and the devil is, how powerful he is, and the lengths he will go through to destroy us. This book was kind of like Frank Peretii’s early books on steroids. Not something you want to read before bedtime if you are prone to nightmares, but a great read. I liked his characters and the setting, and the book definitely held my inerest and I read it through in one evening. A gripping look into the supernatural. Bruce Hennigan will keep you turning pages – each one a little scarier than the last. ~ Mike Yorkey, coauthor of Chasing Mona Lisa and the Every Man’s Battle series. Bruce Hennigan’s “The Thirteenth Demon, Altar of the Spiral Eye” is a thrill-a-second ride and an impressive debut. Intense, gripping, suspenseful, and spooky; once you open the cover, the pages will fly. Carve out some time for this one . . . you’re gonna need it. ~ Mike Dellosso, Author of Scream and Darnkess Follows. I finally had a chance to read Dr. Bruce Hennigan’s novel, “The 13th Demon,” and I was at once creeped out and impressed by the story. It’s not a book I would have normally picked up on my own, since its more in the horror/suspense realm, but since I had written about Hennigan and the novel, I wanted to see what it was all about. The book traces a man Jonathan Steel, who has severe amnesia but a great sense of faith. He goes on a quest to fight a particular demon. When we talked, Hennigan said he had a hard time getting the book published because it was too Christian for secular publishers and too dark for Christian publishers. I can certainly see the dilemma. The story is not always pretty and simple, like you might think of Christian fiction. Hennigan’s descriptions of the demonic are frighteningly graphic, but appropriate to the story. He also deals with the many ways we are tempted. One of his goals was to convince people of the real, physical presence of demons and angels in the world, and I think he made a very good case. I finished the book last night. It was great, Bruce! was one trippy ending, for sure. One of my favorite things about your writing is the relationships. Steel’s time with other characters was handled very tenderly and gracefully — his connection and pain were real and brought a sensitive side to his prowess. I just finished the book. I LOVED IT! I am already ready for part two! What an exciting story this is… I could see the threads of sequels as I was reading. This would make a wonderful movie, too! The special effects would be fabulous! Anyway, I had a blast reading it and it didn’t scare me too much. Yeah, right! I have now read The 13th Demon and liked it very much. I look forward to Jonathan Steele’s next adventure. You are certainly a talented writer and it is a blessing to know your testimony as well. I am a reader and not only just plain liked the story but also appreciated some other things as well. Your analogy of the caterpillar and the butterfly, for example, was a wonderful contrast of this life with the next and touched me to tears as I read it. I don’t know whether this was an original idea with you but even if it was not, you expressed it so beautifully. For a believer, such a picture would of great comfort in the loss of loved ones. May God continue to bless and use you and your talent for His glory. Who knows but that God might use Jonathan to touch and change lives. Certainly Satan has great power but our God is well able to overcome.